The momentum around local online advertising is growing, especially with the expansion of the Web to mobile devices and flowering of Geo-mobile apps which need a way to make money. Today, Citysearch is throwing its hat into the local advertising ring with the launch of CityGrid, a set of APIs which makes all of Citysearch’s local listings content and advertising available to other Websites and mobile apps. The APIs include more than 15 million local business listings, 3 million user reviews, and access to 500,000 local advertisers looking to reach people near their places of business. I sat down with Citysearch CEO Jay Herratti at IAC headquarters in Manhattan to get an overview of CityGrid (watch the video interview above). Citysearch itself is a 12-year-old site which Herratti has been updating, but it is not really growing much anymore and it is feeling considerable competitive pressure from Yelp and, even more so, from Google Local. You can see elements from Citysearch listings already scattered throughout the Web. A New York City bar like The Ainsworth, for instance, will have a CitySearch page, but the same summary description and reviews will show up in a Bing search, on Local.com (with a Citysearch photo), Urbanspoon, Yellowpages.com, MerchantCircle, and so on. Other existing partners include Mapquest and mobile apps like Loopt and Buzzd. Tons of Websites and mobile apps would love to have access to this database of content to build out their own sites and apps, and now they can via CityGrid. But much of this content is also advertising. Citysearch operates on a pay-per-action model. Local merchants can sign up to get sponsored spots in search and elsewhere, and they pay for things like every time someone clicks on their menu, a video, their own merchant description, or makes a phone call for a reservation. They are paying for leads, and the same actions trigger payments on partner sites as well. But in that case, Citysearch is splitting the ad revenue with the publisher. Many of the ads come from other local advertising sites as well, such as Superpages, Yodel, Spafinder, and limos.com. In that case each advertising dollar is split three ways. But ever since Citysearch opened up to those 100 partners, it went from 150,000 paid listings on its own site to 500,000 across its network. “My goal is to get to one million,” says Herratti. Now that it is an open API, he might just reach that goal. Developer who sign up for the API can create local directories on a self-serve basis and will start getting paid once they meet a minimum threshold of ad impressions or actions. While Yelp’s rise is certainly something to worry about, CitySearch’s biggest competitor is actually Google, which is driving a lot of local search to its own Local Pages and has been making a big push lately to sign up local merchants. 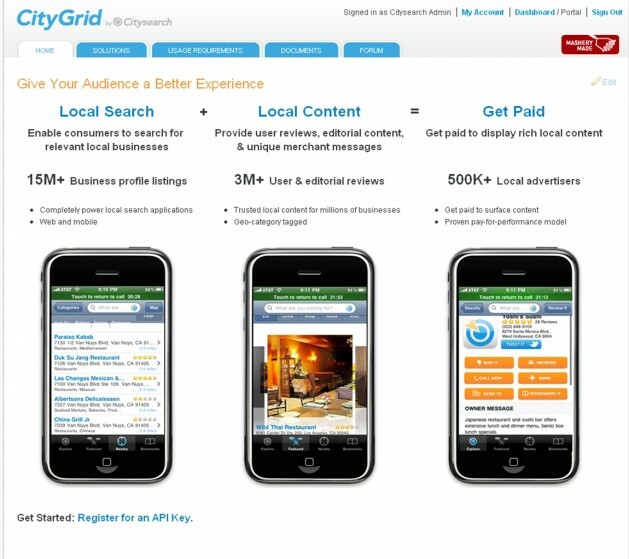 Herratti positions CityGrid as a way fro local advertisers to reach consumers everywhere else. There is search marketing on Google and then there is the rest of the Web and mobile apps. Ironically, if you look up the Ainsworth on Google Local, the pictures and some of the reviews are also from Citysearch, but Google isn’t a paying partner (the content is made available through an older deal). It makes money off the search ads on the side.